'œAt a time when society is reevaluating its ethical stances and individuals are wrestling with changing moral values, Breslauer brings forth his second annotated bibliography on modern Jewish morality. A companion volume to the author's Conerporoary Jewish Ethics, this work is similarly arranged. A brief survey on the major moral questions precedes the annotated bibliography. The major issues examined in each section are: biomorality in light of advances in medical science; sexuality and the family; problems evolving from the Jewish family; moral dilemmas associated with aging and mourning; interpersonal relationships; and aspects of political morality. The citations are to popular and professional articles and books that were written between 1968 and the mid-1980s. Hebrew titles appear in English translations. Cross-references and indexes, by author, title, and subject are invaluable. Both division and agreement between Jewish moral theologians and thinkers can be seen in the critical annotations for each entry. Breslauer superbly analyzes each entry while maintaining his objectivity. Highly recommended for students and general readers investigating modern Jewish morality. 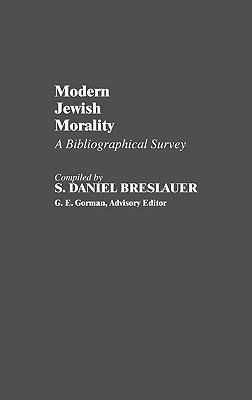 '' ChoiceBreslauer, S. Daniel is the author of 'Modern Jewish Morality: A Bibliographical Survey, Vol. 8' with ISBN 9780313247002 and ISBN 0313247005. Loading marketplace prices 67 copies from $15.39 How does the rental process work?